I used to do more personal, get-to-know-me posts on Sundays and I'd like to take that habit up again. This week, I'd like to tell about what I did on Saturday last week. A very dear friend of mine moved from Switzerland to Belgium almost a year ago, and during the summer we decided it's time I visit her again. 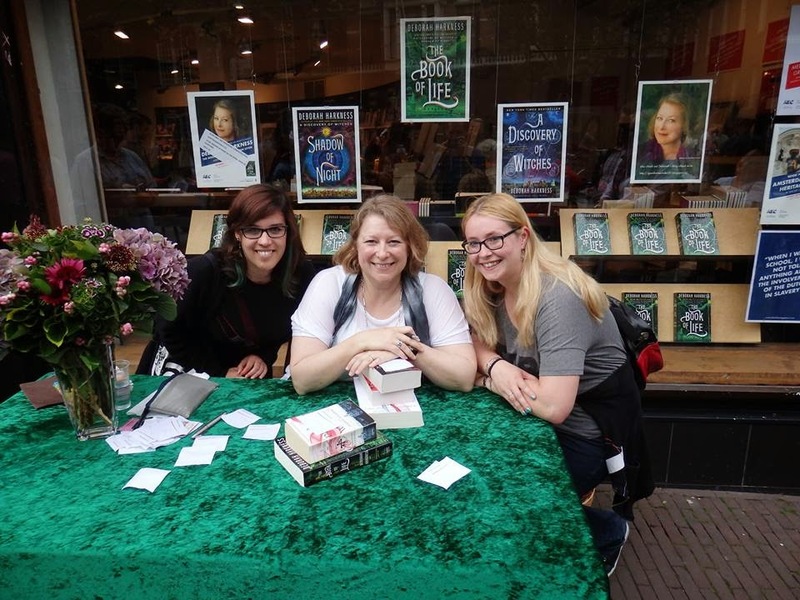 We'd agreed on some time in August, but then she heard that Deborah Harkness, author of A Discovery of Witches and Shadow of Night, would be signing the last book in the trilogy, The Book of Life, in Amsterdam on the 6th of September. So I postponed the trip, and she talked her boyfriend into driving all of us from their little town near Antwerp all the way to Amsterdam. Because he is a great boyfriend, he agreed. Well... not all went as planned. We took off with time to spare, but the GPS lied - you couldn't go 120 km/h on the highway, only 100. So instead of a bit over two hours, the trip took us at least three. Traffic was bad. We also couldn't park where we'd thought we could, and we weren't sure how to get to the bookstore. We were supposed to be there by 1:55 pm at the latest, as they'd lock the doors then. After a mad dash through the inner city of Amsterdam, we arrived at 2:08. We'd already kind of resigned ourselves to the fact that the trip was pretty much in vain, but we rang the bell. And one of the employees opened the door for us!!! :D Thank you, kind Dutchman, whoever you were! So we barged into the room sweaty and out of breath, but it was so worth it! Deborah Harkness was so nice! The event was less a reading and more of a Q&A, and I was glad that there were no weird silences where nobody asks a question. The questions, too, were not just run-off-the-mill stuff but really interesting, relating both to how she came up with the idea of the series, her non-fiction research and writing, combining her academic and fiction-author careers, and whether or not she plans and outlines her books. I can't give you a detailed rundown because I didn't take any notes, I was too busy listening and soaking up the atmosphere. I was also really glad there were no spoilers for book 3, since I haven't read it yet. Despite the car trouble, it was an awesome trip! Thanks again, amazing friend and her boyfriend who has to suffer our bookish moods, for taking us! So glad to hear that your trip was not in vain! Sounds like you had a great time! Yeah, driving all this way and feeling like it was in vain sucked. We almost didn't even go to the store anymore, so I'm very glad we decided 'what the heck, if we could have gone in and didn't we'll want to shoot ourselves'. I wish I could go to events like this more often! Yes, I love having signed copies! It's even better when you actually meet the author :) The first book in the trilogy had me hooked right away - I loved, loved, loved it, and I hope you'll enjoy it too! Driving in the snow is tricky, but I'm glad you stuck it out and had fun! I didn't meet anyone in line this time, but when I was at ALA in Vegas last June, I met some bloggers waiting in line for Holly Black, and that was cool :) Almost makes the waiting an event of its own. It was a cool trip, despite the tension when we were running late! Pity though, I would have liked to walk around Amsterdam some more. I was there for a few days in the summer of 2012 and really loved the atmsophere (and no, I didn't smoke any weed). It's such a laid-back, creative city. And that store really surprised me! I saw a lot of books there that I knew from blogging but hadn't seen 'in the wild' before!